while rearranging the cabinet, I realized that one of the bottles of hairspray was almost empty. I made sure that we used it on Easter, and now it’s been decluttered too. How much progress can you make in just 10 minutes today? OK, I just took your 10-minute challenge and decluttered 8 vases from my “unused vases collection” (there are more). That was fun! It only took 5 minutes, so maybe I’ll do another five somewhere else today . . . like the car trunk, perhaps. Well done Eve. 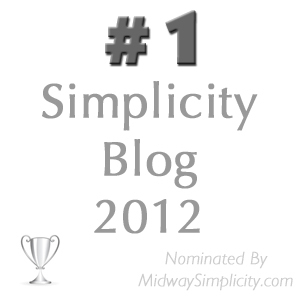 There is nothing like a five minute declutter that yields big results. This prove quite a lot of space can be reclaimed in a very short length of time. Excellent job, Eve. I did this while waiting for coats of nail polish to dry on my daughter’s finger and toe nails. Paint a bit, declutter a couple things, paint another layer, remove another item. I was impressed at how quickly it went and pleased about what great homes I found for every item. Fabulous! 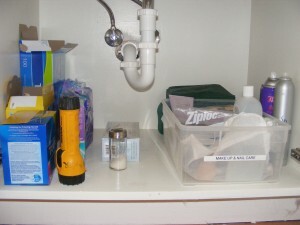 I store cleaning products under my sink (http://tinyurl.com/6f895rk), and I was just getting bummed out about how cleaning products always seem dirty! Ridiculous, isn’t it? Shouldn’t cleaning products seem clean? This inspires me to clean them up and maybe then that area won’t seem so foreboding. I find this problem with stuff in the fridge. I just cleaned mine out and the jars of jam and sauces always leave dirty circles where they sit. I could understand this if there was stuff dripping down the side there isn’t . One could be led to believe the stuff has seeped through the glass. Weird! Liina, I would absolutely say that if your cleaning items don’t seen clean, you should give the bottles a scrub, wash the cabinet floor, and put everything back in neatly (purging as you go, of course). Maybe that will help you have a better feeling about the sink area. I did just that this weekend! It wasn’t as bad as it seemed, but since I keep it “hidden”, it had started to get very scary in my mind. Isn’t it funny how that happens? But I did clean the items and clean out the bin I keep them in, and then I cleaned the whole bathroom while I was at it. It had turned into the monster in the closet, huh? Glad you faced your fears and got after it. Good job! Perfect example of how organizing one cabinet or drawer at a time really works. HI Oksana and welcome to 365 Less Things. I am a non-believer in multi-tasking I often think that if you are doing too many things at once then you probably aren’t doing a good job of any of them. Organising is no different and concentrating on one cabinet or drawer or whatever at a time focuses your efforts on that task and helps keep you mind of the enormity of the complete task. Focusing on how much else there is to do is a sure fire way of scaring yourself off the task altogether. AMAZING results in 10 minutes. 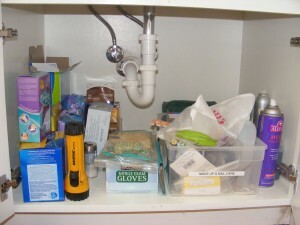 Lucky for me, at this point, the house we are renting in Europe does not even have undersink bathroom cabinets! 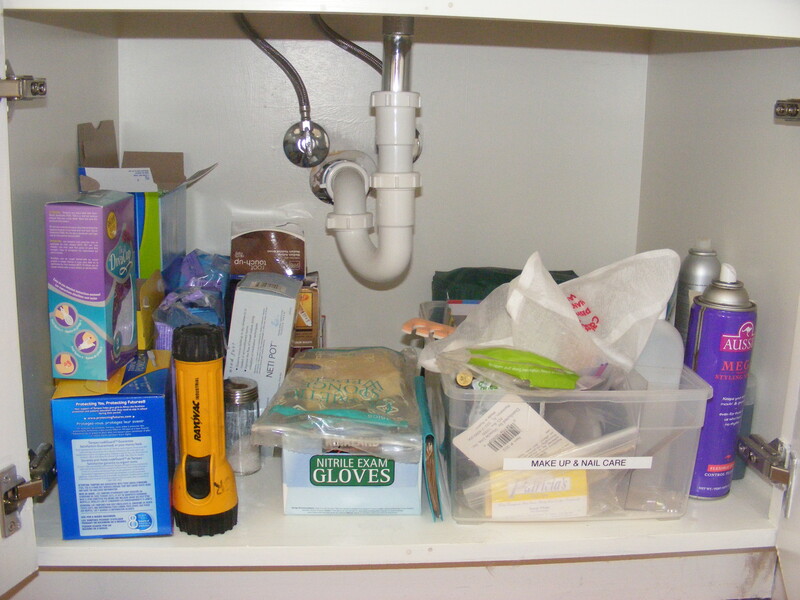 HOWEVER, my undersink cabinet in the kitchen is a disaster zone. I’ll attack it and do before/after photos (I might need to put on a haz-mat suit for this one!). Yeah! Someone else remembers Color Me Beautiful. You know, it’s still the most important fashion advice I ever got. However, since I let my hair grow out gray, I’ve gone from being an Autumn to a Winter, so the color chips weren’t useful any more. (Not that I looked at them except as a rememberance, but still.) I didn’t have the book anymore though, this was a pallette of fabrice samples that you could carry in your purse to get your color choices right. Oh I’m having a sentimental moment. Wonder if the library still has a copy? Thanks for the compliment and glad you tackled under your kitchen sink. Even better that it inspired the children. So where’s our weather report? I remember Color Me Beautiful! Just recently I finally decluttered my little swatch packet. Oh yes, weather report, during my time-warp moment back to Color Me Beautiful I completely forgot (hee hee). Sunny, shorts, short sleeves. Sooo lover-ly! Gorgeous shades of spring green in all the new spring plant life and the blue sky make this a stunning day!